The world's most famous superhero, Superman's adventures protecting Metropolis have thrilled readers worldwide for over sixty years! 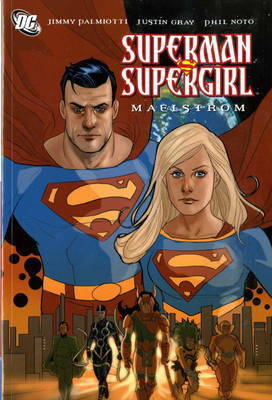 When a crazed villain named Maelstrom appears on Earth, intent on killing Superman in order to win the hand of Darkseid in marriage, the Man of Steel and his cousin, Kara Zor-El, must join forces to stop her. Seeing the conflicted Supergirl in action, Kal-El decides he and Kara need to take a vacation together - but little does he know that his destination of choice is little more than a deathtrap! Writers Jimmy Palmiotti and Justin Gray ("Jonah Hex") join forces with artist Phil Noto ("Birds of Prey") in a story exploring the true meaning of heroism! Justin Gray is a hot new writing talent whose work includes Batman, Battle for Bludhaven, Birds of Prey, Daughters of the Dragon, Monolith and Punisher. Jimmy Palmiotti is a prolific writer and artist whose recent work includes Batman, Fables, Hellblazer, Power Girl and many other DC and Marvel comics. Phil Noto's work includes Batman, Birds of Prey, Jonah Hex and Wonder Woman.